Wilhelm Kientsch was born on 12 May 1921 at Kisslegg in Württemberg. Kientsch was posted to the Ergänzungs-Staffel/JG 27 on 27 May 1941 for operational training. At the beginning of 1942, Oberfähnrich Kientsch was transferred to the Stabsstaffel of II./JG 27 based in North Africa. He gained his first two victories on 18 March when he shot down two RAF P-40 fighters. By late June 1942, by which time Kientsch was serving with 5./JG 27, he had eight victories to his credit and, by the end of 1942, he had increased his score to 16. 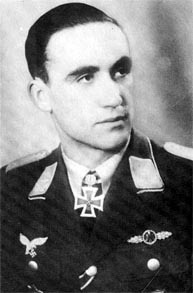 On 1 June 1943, Kientsch was appointed Staffelkapitän of 6./JG 27. He was particularly successful over Sicily and southern Italy in the spring and summer of 1943 claiming 25 victories, including his 20th victory, a USAAF P-38 twin-engined fighter on 16 April, one of eight he was to claim during his Mediterranean theatre service. Also included in his victories were nine four-engined bombers. Staffelführer of 6./JG 27 Lt. Willy Kientsch leaves the cockpit of his Bf 109G-6 Trop. Trapani, spring 1943. 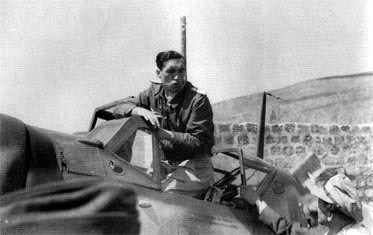 He claimed his 30th victory on 6 June, another P-38 near Pantelleria, and his 40th victory on 17 July, a USAAF B-24 four-engined bomber near Salerno. In August 1943, 6./JG 27 was relocated to bases in Germany to engage in Reichsverteidigung duties. Leutnant Kientsch was awarded the Ritterkreuz on 22 November for 44 victories. On 20 December, he claimed his 50th victory when he shot down a B-24 bomber near Bremen. Kientsch was killed in Bf 109 G-6 (WNr 440073) “Yellow 3” when he became disorientated in cloud during aerial combat and crashed into the ground near Würrisch/Hunsrück in Germany on 29 January 1944. Kientsch was posthumously awarded the Eichenlaub (Nr 527) on 20 July. "Willy" Kientsch was credited with 53 victories. All his victories were recorded over the Western front. Included in his total are 20 four-engined bombers.